There is no arguing the impact that heat injury has made in the working dog world. Many of us know the signs of heat stroke and how threatening this injury can be to the life of a working dog, but the key to reducing mortality is early recognition of signs. This blog post is brought to you by Dr. Janice Baker and our friends at Veterinary Tactical Group. Body temperature alone can’t predict whether a dog is nearing heat injury. Some dogs can reach as high as 107° F and be perfectly normal, while others may succumb to heat injury at much lower body temperatures. The best method of predicting when your dog is getting too hot may be other signs of thermal stress related to behavior and performance, combined with knowledge of your dog’s usual “working temperature.” Some signs of thermal stress are described below. Panting is a dog’s main method of regulating body temperature. As a dog’s body temperature elevates, they will pant to blow off excess heat. At lower body temperatures, they may be easily distracted and stop panting when shown their reward or other object, praise, etc.. As the body temperature reaches near dangerous temperature, they may not be able to control their panting and may not stop panting or show interest in the reward. As their temperature rises, you may notice your otherwise enthusiastic dog sit or lie down without a command to do so. They may also seek shade or cool places to lie down. Remember, YOU may be a source of shade for your dog. Watch to see if he repositions him or herself based on where you are standing. During repeated actions such as chasing a ball, multiple runs of a search, etc. your dog may seem like there are “not listening” to your commands, or their return to you is slow, appears distracted, or off track. This may be your dog delaying their return to you because they anticipate that once back to you, they’ll be asked to repeat the activity or do more hard work. They may actually be trying to take a bit of a break to cool down. While you can’t always predict how an individual dog will react to heat or succumb to heat injury, there are several common risk factors that may make any given dog more likely to have it happen to them. Before you work your dog for training or in a real-world operation, consider if your dog fits any of these situations. If so, you should take extra caution, as your dog may be at increased risk for heat injury. 1. Rapid change in ambient temperature: This often occurs in late mid to late spring when temperatures fluctuate greatly from one day to another. Are you deploying for an operation or visiting another area for training? Compare the temperature where your dog usually works and trains compared to where you are deploying. Is there a difference in the average temperatures over the past week or two? A change in temperature even 10-20° F degrees may feel like a welcome change for you, but can cause significant difficulty for your dog in keeping cool during exercise. It’s important to note that the difference in temperature from what the dog is used to may be more important than the actual temperature outside. Dogs from cold weather areas used to zero and subzero temperatures have been known to heat stroke at ambient temperatures of only 30° F! 2. Long periods off work (greater than two weeks): Dogs can quickly lose condition when not working. Have you been too busy to work your dog lately? Has bad weather prevented you from training and exercising your dog? Be honest with yourself on how much exercise your dog has had in the past month prior to an event or deployment, and take extra caution if he may have had a little too much “couch time” prior to being asked to work hard again. 3. Recent weight gain: This often goes along with time off work, above. A few extra pounds on a dog can mean a significant change in their fitness or how hard they have to work to carry the extra weight. We recommend that you weight your dog at least once a week and keep a running chart, which may make it easier to see trends in weight gain or loss over time. 4. Working harder than their current level of fitness: It may be easier in training to limit your dog’s exercise and provide adequate rest breaks compared to when you’re in a real-world operation. You may be influenced by a strong desire to help, distracted by the situation and your surroundings, or may be feel pressure from leaders or others to keep working. Many dogs will keep working until they drop, so we have to keep in mind their actual level of fitness. Have they worked this long and hard before? You can only expect them to be as physically fit and acclimated to heat as you have prepared them in their training. If it is hotter than they are used to, or the work is more strenuous than you usually train, then your dog is at higher risk for heat injury than during training. The best way to prepare your dog to tolerate hard work and heat is to train at or above the level of fitness required during real-world operations. 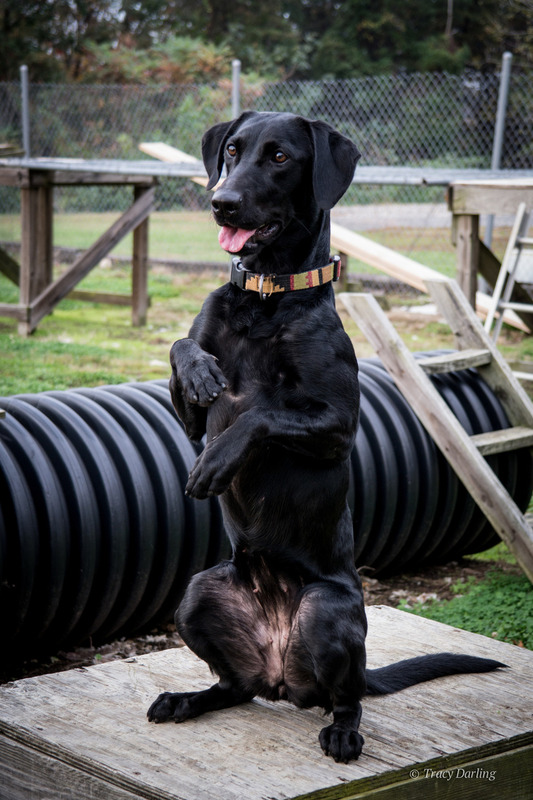 This beautiful young Labrador called Pacy is a disaster human remains detection dog in training. 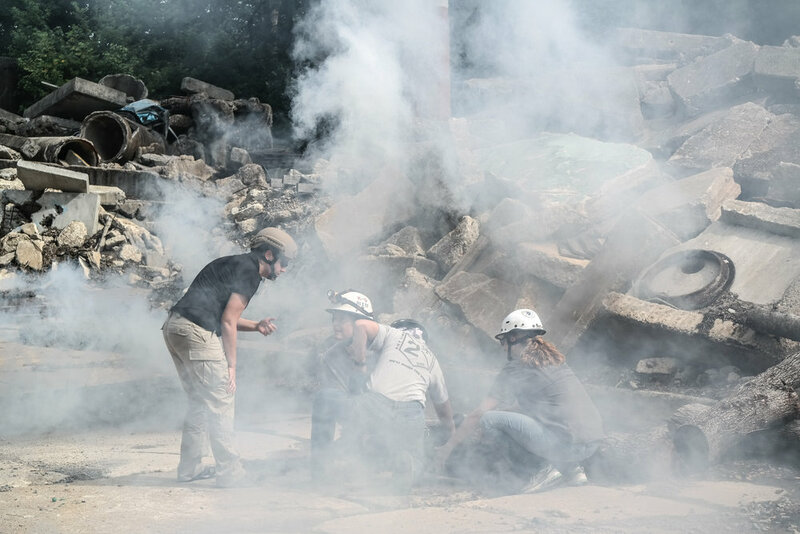 Disaster search dogs are required to climb over all kinds of debris and rubble such as after a building collapse. This type of work requires that dogs have incredible strength and agility to avoid being injured. In this photo she demonstrates an exercise called “chipmunk” which she does regularly as part of a core strengthening program.